If I had a dollar for every time someone said to me, “I’m trying to lose weight, what’s the best alcoholic beverage to drink when I’m out,” I’d be rich. Before I answer your million-dollar question, let’s talk a little bit about alcohol, its’ effects, and how your body metabolizes it. When you consume alcohol, it’s the first thing your body burns for fuel. Meaning, you’re not able to burn fat at the same time. 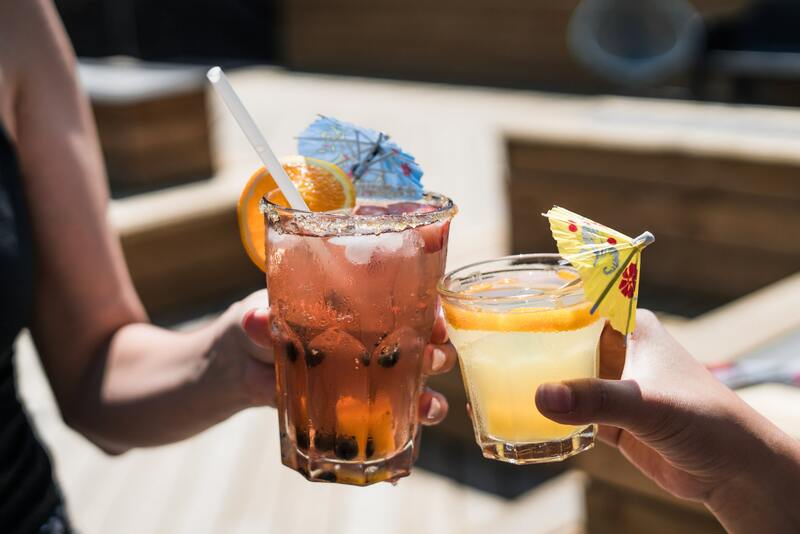 Therefore, it isn’t necessarily the alcohol itself that will make you gain weight, but the fact that your body isn’t able to metabolize fat or any other foods consumed when drinking. We all know how the late night munchies go after a few drinks, right? Alcohol tends to affect our inhibitions. It’s easy to have a few drinks and then consume a lot of food, typically unhealthy, processed, greasy junk food, without even thinking twice about it. The chances of drinking and then eating nothing are pretty slim in most instances. Alcohol also counts as “empty calories.” In other words, there is literally no nutritional value to these calories. No protein, fiber, or nutrients of any sort. Alcohol contains seven calories per gram of alcohol, which is only two calories less than one gram of fat. This is almost double the number of calories per gram of carbohydrates and protein which are both four calories per gram, and again, providing no nutritional value. Let’s use wine for an example. A 5-ounce glass of wine will typically contain 110 calories, 91 of which come from the alcohol itself (13 grams), with the remaining five grams coming from carbohydrates. Alcohol also makes us lack motivation. Why? Because it effects the quality of our sleep. While you may fall asleep faster after consuming alcohol, it actually hinders you from falling into a complete REM cycle (Rapid Eye Movement). “Alcohol may seem to be helping you to sleep, as it helps induce sleep, but overall it is more disruptive to sleep, particularly in the second half of the night,” says researcher Irshaad Ebrahim, medical director at The London Sleep Centre in the U.K.
“Alcohol also suppresses breathing and can precipitate sleep apnea,” or pauses in breathing that happen throughout the night. The more a person drinks before bed, the stronger the disruption. One to two standard drinks seem to have minimal effects on sleep, Ebrahim says. That being said, alcohol limits our motivation, which tends to decrease our physical performance and ability to reach our potential. There are some benefits to drinking alcohol in moderation. Everyone knows how negatively stress can affect your body and its’ health. Alcohol is known to relax us and ends up being a way for many to “de-stress” or “unwind.” In moderation, this can be beneficial. The reality is that many of us like to enjoy alcoholic beverages from time to time. No judgment here. While drinking may be unhealthy, so is sitting for 8-10 hours at a computer, staying up late, spending too much time in the sun, etc. Many things are unhealthy. • Whiskey/Brandy/Scotch/Cognac – Full of healthy antioxidants as well. 64 calories and zero carbs. White wine– ~130 calories and ~5-6g carbs. Not a terrible option, but not nearly as many of the healthy benefits you get with red. • Light beer – ~100 calories and ~3-5g carbs. This varies on the type and brand of beer. Yes, lower in calories and lower in carbs, but beer is created from a grain and it’s easy to consume LOTS of these very quickly. Regular beer– ~150 calories and 10-14g of carbs. Made of grain, easy to consume half a dozen of them without batting an eye, and full of calories and carbs. If you’re a real beer drinker (I am), do so in moderation. I’ll refer you back to the “what are your goals” section to determine what “moderation” is for you. • ___________ and coke/sprite/orange juice/cranberry juice. Sugar, sugar, sugar, sugar, calories, sugar. The innocent cranberry juice you added to your vodka? 120 calories and 30 grams of sugar. • ___________ and Red Bull – Although I love Red Bull’s marketing, I hate their drink. Both alcohol and caffeine are diuretics which will put wings on your dehydration. On top of that, the alcohol tries to slow you down, the caffeine tries to speed you up – your body has no effing clue what to do. • Pretty much anything frozen – Sugary margaritas, daiquiris, pina coladas, hurricanes, vodka Red Bull slushies (yes these exist, stay far away!). There’s enough sugar in these drinks to make Def Leppard think ‘that’s a bit much’. • Sangria – Think of it like wine but with 20 packets of sugar added in. Try to consume alcohol only on rest days, in moderation, and sticking to the healthier options listed above. Load up on lean protein and vegetables throughout the day prior to drinking. This will help account for the carbohydrates alcohol provides. As well, hopefully fill you up enough will quality protein to keep you full so you don’t binge eat after a couple drinks. Stop drinking an hour or so before bed and drink several glasses of water.